Who will score more runs? Check out in this Prediction Tips post. Punjab will take on Rajasthan at PCA Stadium, Mohali on 8th April. Punjab have won four matches and lost four to be placed at the fifth position in the IPL points table. On the other hand, Rajasthan find themselves at the seventh position, having won only two matches and lost five. The Punjab vs Rajasthan rivalry has seen 18 matches being played so far, with Rajasthan having won 10 of those games and Punjab the remaining eight. Overall Rajasthan have won the title once, in the first season, while Punjab have never managed to win it even once. When these two teams met each other last season, both teams managed to win one match each. 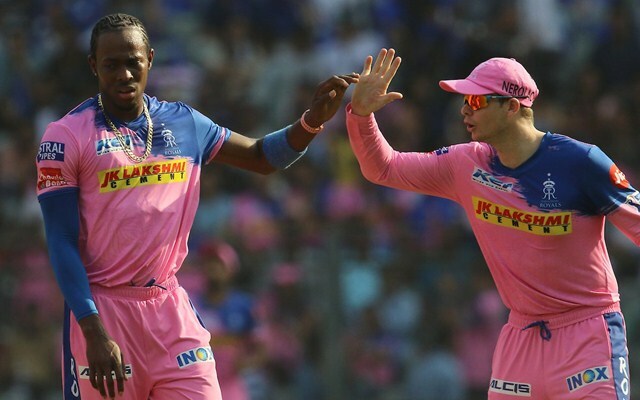 This is the second encounter between these teams this season, with Punjab having won the first one by 14 runs – that match featured the infamous ‘Mankading’ incident with Ravichandran Ashwin and Jos Buttler. 2) Which pacer will concede more runs? 3) Which bowler will pick more wickets? 4) Which Bowler will pick more wickets? 5) Who will score more runs? 7) Which batsman will hit more sixes? 8) Who will score more runs? 9) Will Dhawal Kulkarni pick 1 or more wickets? 10) How many aggregate bowlers will pick 2 or more wickets? 11) Which team will add more runs for opening stand? 12) How many batsmen will have strike rate of 150 or more in this match? 14) How many aggregate runs will be scored in this match? 15) How many aggregate wickets will spinners pick in this match? 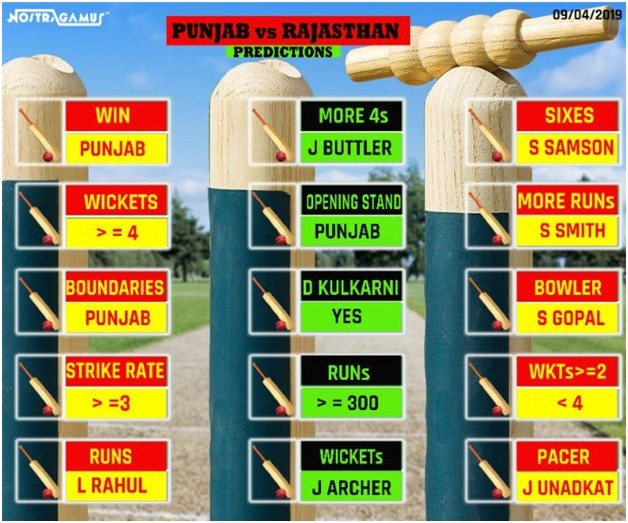 Predict Punjab vs Rajasthan for the chance to win real cash upto Rs. 50 Lacs! Download Now & Get Rs 100 Joining Bonus AND 100% CashBack on First Deposit!! The Mohali ground is probably one of the biggest ground in India and hitting a six might be a difficult one but scoring runs is the easiest part. It’s a batting friendly pitch where the average score is between 170-180 in T-20 cricket. Download NostraGamus & Get Rs 100 Joining Bonus!